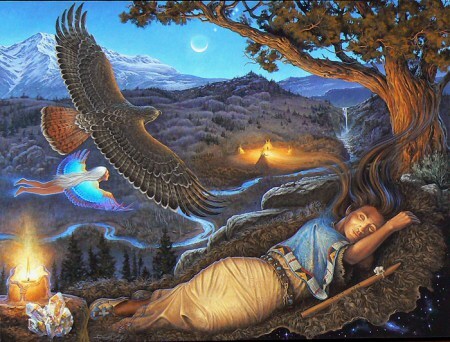 During a shamanic journey, a shaman will use a visionary process to travel to the spirit realm to request healings, receive divine messages, help guide lost souls home (psychopomp), and commune with nature and the universe. In the spirit realm, a shaman interacts with spirit guides, ancestors, spirits of people from this world, angels, and enlightened beings. Power animals act as protectors and guides for the shaman. They can be a part of a shaman’s journeys for many lifetimes or brief periods during which their archetype power is needed. The spirit realm has three “worlds”: the lower, middle, and upper. None of the realms are better than the others; they simply offer different experiences that are appropriate for different circumstances.